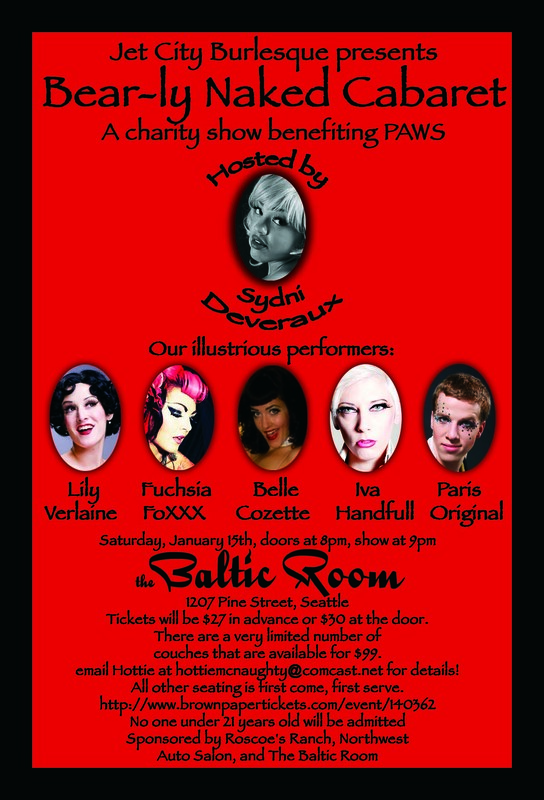 Jet City Burlesque is excited to present some of Seattle’s finest performing artists while we come to together to support The Progressive Animal Welfare Society. PAWS has taken in at least eight bear cubs this year and it costs $70 per wee…k, per cub just to feed them. Bear cubs are much like teenage boys…they really will eat you out of house and home! With an array of wonderful talent to pull from in Seattle and surrounding areas, Jet City Burlesque often sets out to show you the comical, the sultry, the beautiful and the bawdy with their performance selections. Always looking to help out the community, JCB produces shows that benefit an array of very worthy causes, all while delighting the audience. Seattle has two great things going for it: A vibrant performing arts community as well as a generous community dedicated to animal welfare. Isn’t it time those two come together for an extraordinary night of fun and philanthropy? Hottie McNaughty will be on hand to keep it tidy and Pinky Shines and Ruby Whiines will be our raffle mavens for the evening. Tickets will be $27 in advance or $30 at the door. There are a very limited number of couches that are available for $99. Please email Hottie at hottiemcnaughty@comcast.net for details! All other seating is first come, first serve. Everyone receives a door prize ticket and raffle prizes will include a complimentary 3 night stay at Roscoe’s Ranch, two art prints by Matt The Photographer, two Jet City Burlesque party packs and more to be announced!